Brown Caterthun White Caterthuns Walk, Angus, Little Brechin. The Brown and White Caterthuns are neighbouring hill forts, the summits of which form an excellent vantage point in the heart of Angus. Inspecting them both at close range is an easy walk of a couple of miles duration, ideal for a fine summer evening stroll. Car parking and some rather dilapidated picnic tables are provided on the minor road which bisects the two ancient monuments a few miles north west of Little Brechin. Taking in the Brown Caterthun first, cross the road and clamber over the wooden fence at a stile. A sign post points the way and there is a small information board with an artist's impression of what the fort would have looked like when it was in use. Follow the Land Rover track through the heather scrub to the 287 metre summit plateau. Across to the east, on a clear day, the vast expanse of water comprising the Montrose Basin, a haven for aquatic bird life, is easily picked out. The port structures near Ferryden and the steeple at Montrose also break the horizon. To the north the view is dominated by the Hill of Wirren, rough shooting country managed by the Gannochy Estate. The Brown Caterthun surrounds the summit of the hillock you are standing on with its six earth banks. These banks give added strength to the naturally defensive position of the site. According to the information board at the start of the path, there are an unusually large number of gaps in the bank for a defensive fort. If all the gaps are part of the original work the site may have had a more complex function. Similar sites, which were thought to have had a ceremonial use, were built elsewhere in Britain about 5000 years ago. The precise date of the Brown Caterthun is not known. If not as early as the camps elsewhere, it may be contemporary with the neighbouring White Caterthun at around 2500 years old. 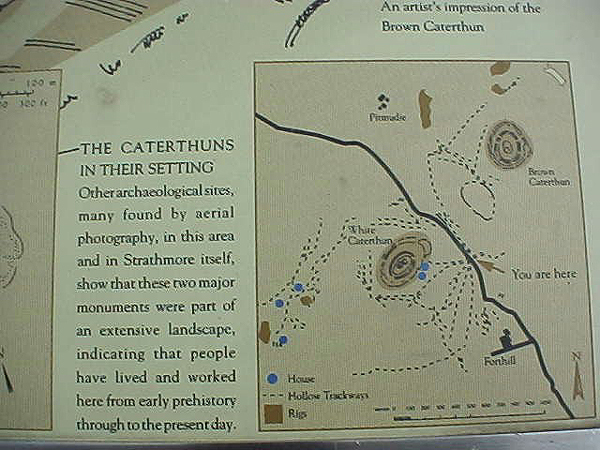 Explore the table-flat top of the Brown Caterthun before retracing your steps, crossing the road, and ascending through a field to the White Caterthun which, at 298 metres, is the higher and more impressive of the two. The White Caterthun has a massive spread of stones, tumbled from two concentric walls, which in their day must have presented a formidable sight. The inner wall alone was around 12 metres thick and several metres high, enclosing an area of about two acres. A great hollow in the interior marks the location of a large rock-cut cistern that held the fort's water-supply. This stone fort, which is one of the best preserved examples of an Iron Age fort in the country, would have provided a virtually impenetrable barrier to attackers. Situated on top of the hill, the occupants would have been able to see danger approach from miles away. When you have finished savouring the extensive views and rich history of this popular landmark simply retrace your steps back down to the road. Start/parking Purpose-built layby (GR: NO 552661), a few miles north of Little Brechin. Grading Easy walk suitable for all ages. The White Caterthun is the steeper of the two and the ground is likely to be wet underfoot. Dogs on a lead due to sheep grazing.